War-date pair of 1864 Lincoln-McClellan Presidential Campaign "Soldier's Ballot" covers. 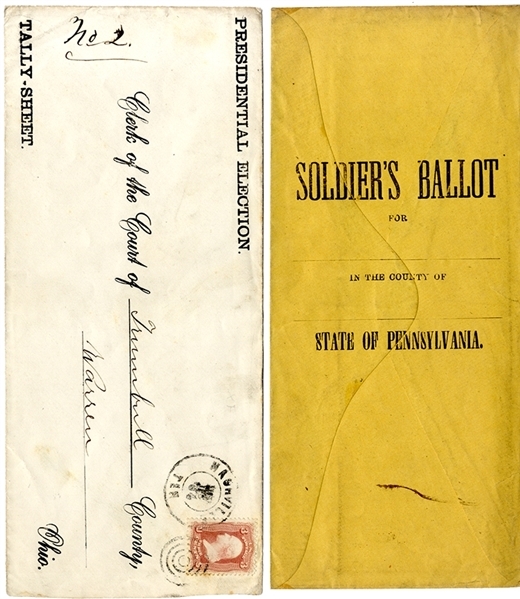 One with “PRESIDENTIAL ELECTION” boldly printed at top left, Nashville, Tennessee postmark, and sent to the Clerk of Court of Trumbull County, Ohio, and the other for Pennsylvania soldiers of York County, and bears a free frank of Amos Myers, Representative from Pennsylvania. Both fine condition.